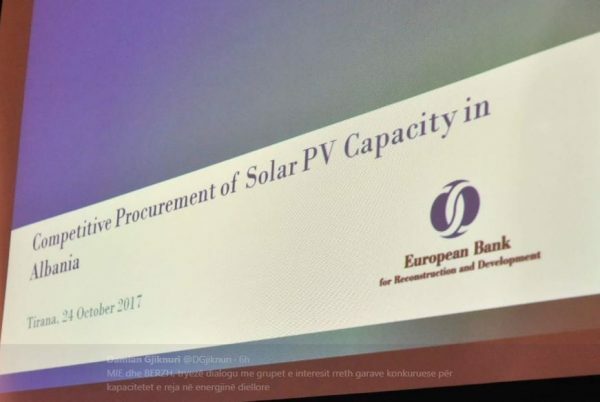 In May 2017 the European Bank for Reconstruction and Development (EBRD, or the Bank) and the Albanian Ministry of Energy and Industry (MEI) signed a Memorandum of Understanding (the MoU) on cooperation to develop the regulatory framework for solar power and the subsequent development of solar power projects. Following the signing of this MoU, the Bank is now proceeding to provide assistance to the Government of Albania, through engaging a consultant to provide support in: drafting the secondary legislation and regulatory framework for the competitive procurement of solar PV projects in Albania, and assisting in the implementation of a competitive bidding process to procure 50-100 MW solar PV capacity in Albania. 1) Reviewing the existing legal and regulatory arrangements in Albania, accounting for ongoing and planned reforms. 2) Adapt, for implementation in Albania, the Guidelines developed by EBRD on the design and implementation of competitive processes for supporting renewable energy, taking into account current arrangements, existing plans, and the market context. 3) Develop secondary legislation and regulatory rules needed to implement recommendations. 4) Conduct an assessment of the technical options for the solar PV programme (e.g. size, location, etc.) and provide recommendations. 5) Conduct a site-level strategic environmental and social assessment and master disclosure and engagement plan. 6) Provide implementation support to authorities for the support programme. The Consultant will be a firm or a group of firms with previous project experience related to all project objectives. The assignment is expected to start in Q2 2018, and has an estimated overall duration of 24 months. Cost estimate for the assignment among to EUR 950,000 exclusive of VAT. Disclaimer: The authorship and the opinion expressed pertain to their authors. While every effort are made by Esc Adriatic to ensure the accuracy of which publication, it is not intended to provide legal advice as individual situations may differ and should be discussed with an expert and/or lawyer. For any specific technical or legal advice on the information provided and related topics, we offer to direct communication through “info@albaniaenergy.org”.